Visit https://www.aquiire.com/ to learn more. Spend Matters welcomes this sponsored article from Aquiire. Industry benchmarks have shown that approximately 30%–50% of an organization’s external spend is on indirect goods and services. These purchases include office supplies, IT resources, electronic equipment and accessories, software, stationery, printing, consultants and contractors. The cost of indirect spend can add up quickly. However, studies have shown that for a typical company, a 5% reduction in purchasing cost can improve the bottom line as much as a 30% increase in sales. But CPOs and other purchasing leaders face a tough battle to secure a budget for investing in vital e-procurement software unless they can show a strong proof of impact and a measurable ROI. As financial pressures come to bear, procurement will be one of the first areas that a chief financial officer will charge to drive savings. Typically, one of the initial opportunities identified will be sourcing savings opportunities. In parallel to the sourcing focus, the procurement department needs to assess its requisitioning/purchasing infrastructure to make certain there is a foundation in place to drive savings by ensuring the organization purchases off negotiated contract pricing and from the approved suppliers and commodities, as well as ensure they are receiving the lowest possible pricing with the highest levels of service and value. They also need to assess if their requisitioning/purchasing process drives end-user adoption. Without end-user adoption and a compliant purchasing infrastructure, the expected negotiated savings will never be achieved. When considering implementing an e-procurement solution, procurement needs to determine whether the canned functionality of a large ERP or e-procurement system provides the experience that is needed for end-user adoption, or whether a point solution with deeper functionality is needed to accomplish their goals. Often, the “normal” ERP or e-procurement requisitioning system is extremely complicated, encouraging users to circumvent the established procurement processes. Does the organization require a major expenditure to obtain a complex source-to-pay (S2P) or procure-to-pay (P2P) system to achieve your desired end state? Do you require a more flexible marketplace, catalog management and spend analytics solution that works with your current systems to achieve your desired end state? 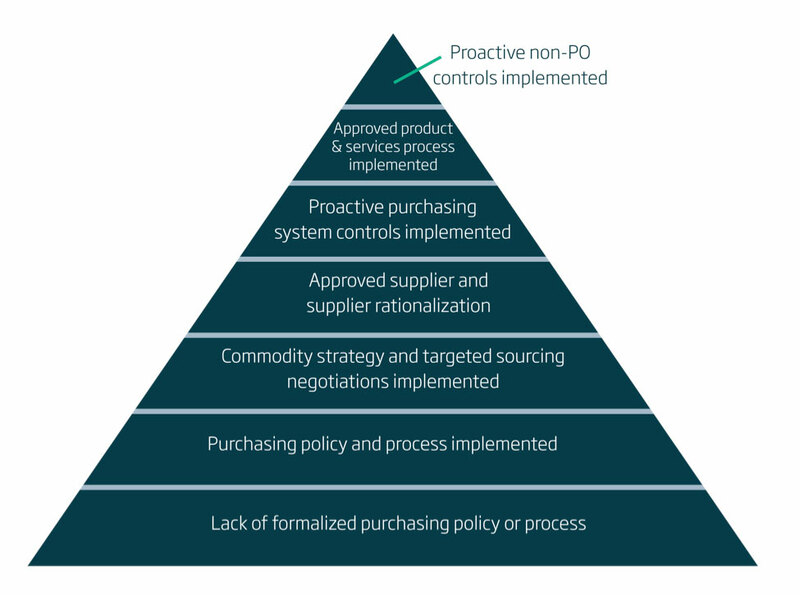 See the pyramid diagram below, which outlines the evolution of developing a formalized purchasing process. An organization’s e-procurement strategy should be conceived holistically as an integrated part of the overall procurement strategy to ensure the business objectives are met. It is important to understand the impact of your e-procurement plan on the structure of your entire organization; therefore, clear communication is required at all stages of the project. In the end, you will come away with a much stronger, streamlined, collaborative and financially-viable organization that is ready to take your procurement operations to the next level of success. Download the complete white paper: 12-Step Program for Implementing a Successful E-Procurement Strategy.